The internet world of online retail sellers has become the new arena of retail sales in our world, but not many people outside the industry know the challenges we face as online merchants who sell everything from table throws and runners to trade show flooring. Many of the trade show related products come in multiple color options, and much of the time certain products will have accessory items too, with many of them available with custom options. Then on top of that, we normally have to ship in 5 -10 days, and quite often, they will need to ship directly to the trade show and not the customers address. The manufacturer’s business has to be structured to meet these challenges, and the company we've proudly chosen is Classic Exhibits in Portland, Oregon. 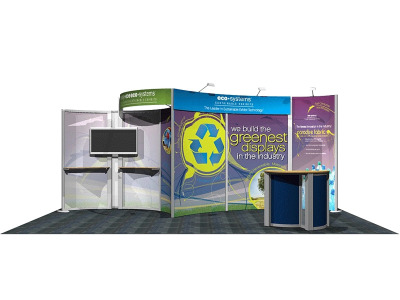 Classic Exhibits, who has been manufacturing show displays in excess of a quarter century, is able to grasp the manufacturing challenges of the exhibit display business, and has also created some "best in class" products during this time. Sadly, most online companies represent product lines which are pre packaged in China and shipped to distribution points and then when an order comes in, the product is pulled and shipped out without even inspecting it first, which tend to be a very boring style of show displays. Classic Exhibits has had many successes with inline exhibits such as the Magellan Modular Displays, as well as many products in the tension fabric displays line. Now that we have Classic as our major exhibit supplier, ShopForDisplays can be confident of their future.